I'm performing a fishless cycle on a new freshwater tank. I have a new scrubber and also a canister running on it. I would eventually like to just run the scrubber, if possible. The tank has been filled with well water, so no ammonia or chlorine. The canister has seeded bio media in it. For 3 days I have been adding ammonia to get the nitrogen cycle started. The scrubber will eat the ammonia as well as the canister. It is starting to grow a haze of algae, but not much. My ammonia levels are at about 2ppm. My questions are... will this work, and am I going about this the best way possible? Should I just be concerned with the algae growth and not so much the canister media? Thanks. I have seen many tanks cycled with a scrubber, and for whatever reason, there is very little growth until the tank is stocked and fed. But at least the scrubber will be ready. I started a screen with "waste" water from water changes on my smaller tank. It did work. The small tank during some of that time had moderately high phosphate and nitrate levels. I suspect that your well water + salt mix is limited in one or more required nutrients. Ammonia gives the nitrate but other things are needed. Thanks. There's no salt as this is a freshwater tank. I am wondering if adding ammonia to get the nitrogen cycle started in both the scrubber and a seeded canister filter is the correct way to go. Both are trying to consume the ammonia, and typically I'd see a nitrate spike when the canister bio has been established. 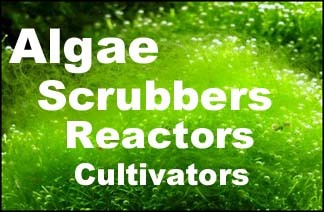 However, the scrubber will also be consuming nitrates at some point... so how will I know? More algae on the screen? We need Algaescrubber.net T Shirts! Well, its been two weeks of fishless cycling with ammonia and algae is starting. Nice. You did rough up that screen, right? Yes...to the point of almost shredding it. As you stated, a holesaw is by far the best way to do that. And currently, all the algae that's starting is in those scratches. More Progress, 3 days later.....still no fish, ammonia only. Coming along nicely. Fish are going in tomorrow.